Sam Smith opens his mailbag to answer reader's questions. Just read an article that if Tai Gibson were to be traded his current value would be a first round pick. I don’t see his value that high unless he agrees to an extension with the team he’s traded to under the table. Sam: Agree, which is also why I don’t think he’ll be traded. No. 1 picks have grown increasingly in value with the new labor deal and the new built in difficulty in obtaining top free agents. Not only finding your own, but having players on manageable contracts for several years is more crucial now, and that comes from first round picks. No one’s giving up a No. 1 pick for a two-month rental. OK, the Cavs did for Kyle Korver, but that’s because GM LeBron doesn’t care about the franchise beyond his next few years. Unless they agree to sell it to him cheaply. Which I’m sure we’ll hear one of these days, or that they should. As for Taj, and I know this all depends on economics, but if it were up to me I’d bring him back on a new contract next season. Of course, it depends on his market, but he’s only going on 32, hasn’t played all that much in his career, and is such a valuable player, person, leader, team guy that his type of player could be more difficult to replace than almost anyone on the roster. You want people like that around all the time, and not just we media people because no one is more stand up and engaging on the entire team. I look around the East at power forward and I don’t see many better. Probably Love, Millsap, but not by much. Serge Ibaka? I’d rather have Gibson. The Morris twins? I’m happy with Gibson’s physical presence. I’d have taken Jabari Parker, but terrible news. Thaddeus Young? Ersan Ilyasova? Patrick Patterson? This is one of the top three or four overall power forwards in the East and having one of his best seasons, growing with his shot and I’m believing he gets it out to three-point range. If the Bulls go whole turnover, OK, but you don’t find many like Taj, one of the Bulls great low draft picks ever. If you are keeping Robin Lopez, and he has a long term deal, I like the way that tandem plays. Can you do better? I was watching the Knicks and Clippers (dont ask me why) when they swung to Oakley getting tossed. I have never seen 7 security guards so scared but I also don't think I have ever seen a more sad sight during a game than watching an absolute legend getting tossed from an arena during a game. 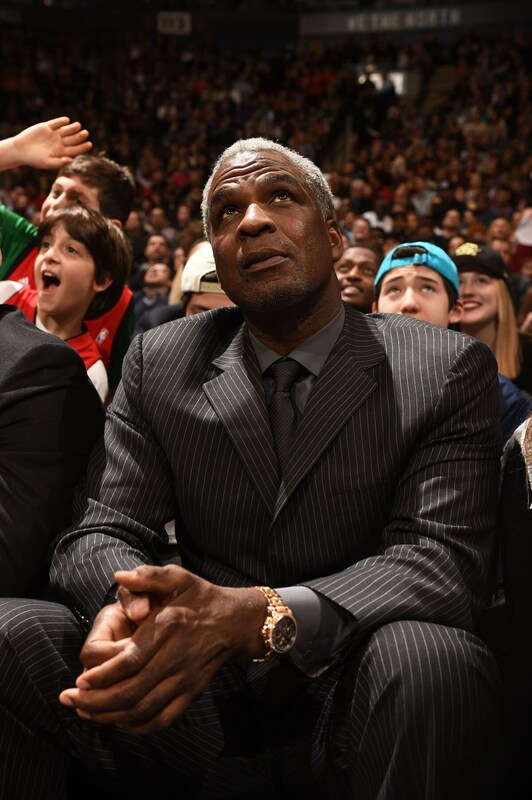 10 years the Oak man was the Knicks enforcer - how did it end up like this? Sam: I guess we all have to weigh in, which is what makes the NBA so great. Really, in what other sport does this happen, though I wince a bit on this one. Obviously, there is so much he said, they said. I will just say what I know about Oak, who is one of my favorite people since I began covering him more than 30 years ago: Oak tells it exactly like he sees it. He’s not politically correct, and can be his own worst enemy. He says the things, sometimes, that will get him banned, as it has from the Knicks with brutal criticism of management and ownership, and even with his buddy Michael in Charlotte when Oak was an assistant coach there and they had to quietly dump him because he was violating the labor moratorium by being honest with media and potentially costing the team $1 million fines in multiples. I remember covering the 1999 labor lockout. Oakley’s first big contract was about to go away if the players didn’t settle that day. Barkley in the meeting makes a big speech basically at the end of his career about standing up to the league and you’ll are cowards and Oakley basically beat him up. I probably wouldn’t have wanted to settle the debate that way. Remember, that’s the Barkley who once body slammed Shaq in a game. Oak’s critique of Tim Floyd’s coaching cost him a $50,000 fine from the Bulls, the only team fine I can recall for telling the whole truth that accurately. I don’t know what happened, and the Knicks seem sure they have the independent witnesses to back up their contentions of Oakley’s erratic behavior, and maybe to them it was and not to Oak. I just have never known Oakley to fabricate events even when they made him look bad. Everyone was saying how they wanted the Bucks youth. Now they are very quiet. Jabari will be lucky if he comes back to be Ron Harper from his later days. Why not just play Valentine at point? Sam: They’ve got Michael Carter-Williams and Jerian Grant and Rajon Rondo, and so you may also say they don’t exactly have the true point guard they’d want given shooting limitations for some, passing for others. Valentine has elements of both, and I think he has a good feel for the game and can make shots even though he rarely has lately other than in that Washington game and in Canton or Erie or somewhere. The way the Bulls play with Butler and Wade controlling the ball so much, Valentine probably can play “point guard” because they don’t really have the position filled as you’d like it to be for the future. So the tryouts continue. I assume he’ll get more of a look. 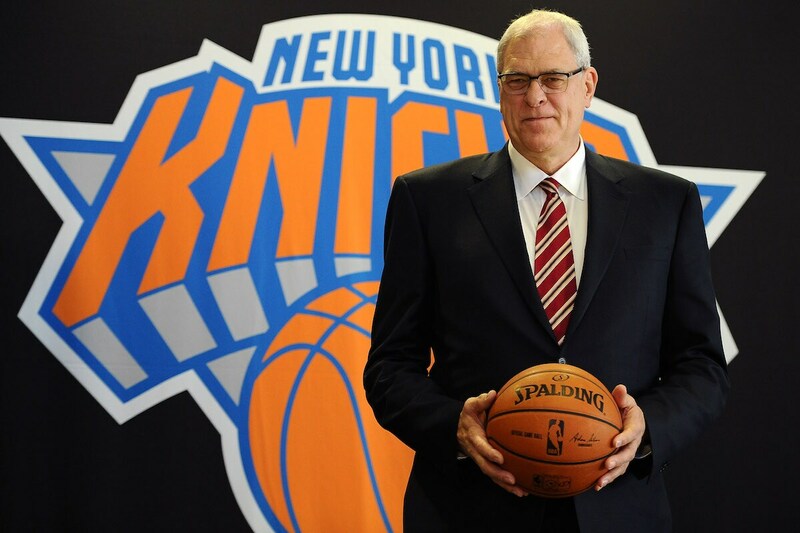 Has Phil Jackson finally Phailed? Yes they are referring to Phil as “Phailed Jackson" in New York. The “Fire Phail" chants have been heard at the “World’s greatest Arena”. What is your take on the Knicks? I am also intrigued by where Rose will end up next year. He seems to miss Chicago and the Rhondo experiment seems over. Is it possible Derrick returns to Chicago IF the price is right? 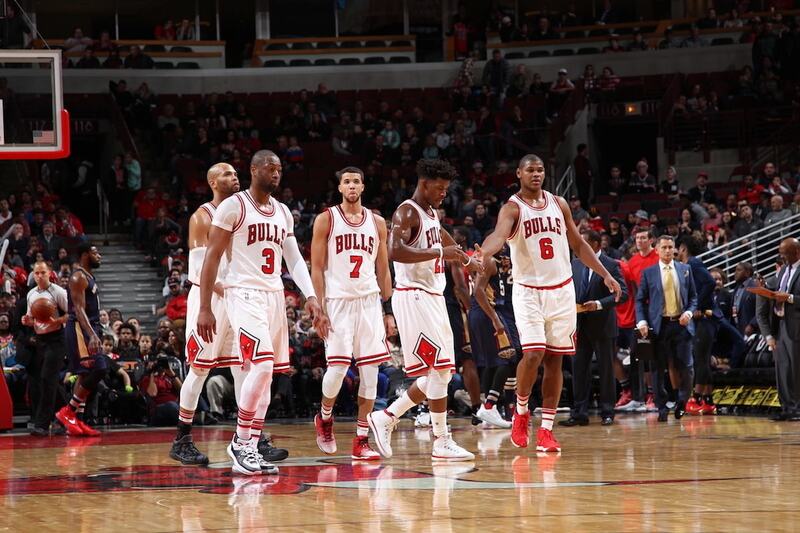 Rose, Butler, Wade, Lopez and Gibson make a formidable starting unit. Sam: As much as everyone knows I like Derrick, they’ve all moved on and I think it’s best for both sides. Derrick will always be measured here against what he was, and that’s doomed to fail, and the Bulls will always remember what he could no longer be, and that’s not ideal. Derrick has had a good season and what people forget is what he’s doing now is what we always thought he’d be, averaging about 18 points and five assists. He just had one of the most offensively challenged rosters in NBA history with Noah, Ronnie Brewer, Keith Bogans; sort of the 76ers with Iverson and four guys to fetch the ball. So Derrick took off and scored. I actually remember blowing off fans writing me in Rose’s rookie year asking if he could be league MVP and saying it was impossible because he never could score like that. Sam:OK, once I was wrong. Oh, Phil. No, he hasn’t failed. He just hasn’t succeeded. They won’t see it that way in New York with the media and fan base’s historic knowledge being the last thing they saw. This dance with Carmelo Anthony has been classic Phil, going directly first and apparently finding out Carmelo won’t give up his no trade, so then taking angles. Anthony is a terrific talent, or generally was since he’ll be 33 soon and never has taken too much care of his body. Ownership gave him that no trade deal—and I’m not unsympathetic to Anthony since he bargained for it, got it and deserves to have it enforced—but Phil wants to build a different type team. He tried to make the right moves around Anthony, a scoring point guard on a short term deal and defenders in Noah and Courtney Lee. He brought in a highly regarded coach in Jeff Hornacek who was a coach of the year almost every year in favorite until he was fired. They haven’t meshed. Sam:Criticism is not just pointing out someone failed, but explaining what you would have done differently that would have succeeded. Phil took over a team that had basically given up all its No. 1 draft picks but one, and he got Porzingis with that one. Not bad. He signed free agents, made a big trade for a star scorer, got a good coach. He actually did what they all were shouting about; but when it’s not working they all say he should have done, now exactly what with Anthony refusing to budge? 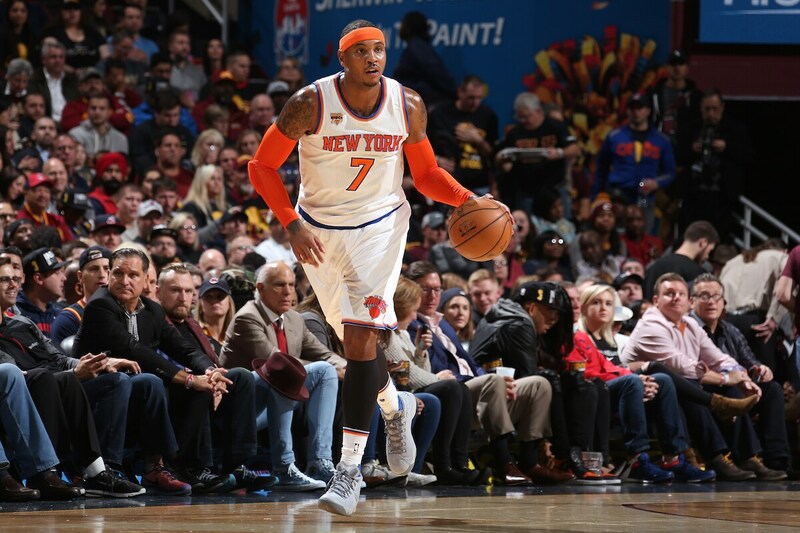 Melo to Bulls? They're already hard to watch as it is. I sure hope that there's no way that this could happen. 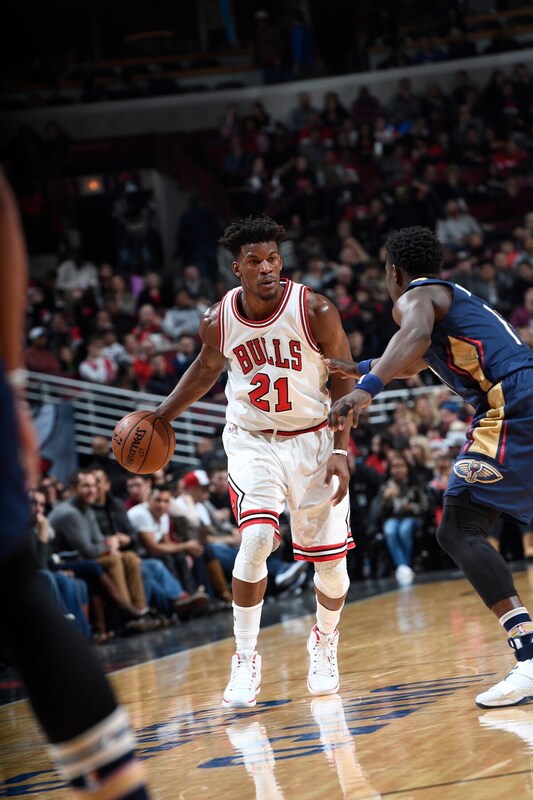 Sam: It’s such a ludicrous notion that I don’t think the Bulls were even upset that it was a rumor or speculation. So you paid big money for Dwyane Wade after his best playing times. OK, it’s worth a shot for a year or two for his championship experience and history of success, his connection to Chicago, community connection and willingness to cede to a better younger player in Butler. Now you’re going to pay way bigger money for longer for a guy just about as old, probably in poorer shape who’s had basically no team success, no connection to the city and who still sees himself as the Man? So some think the ball stops too much now with the Bulls? Wait until you’d get a look at Anthony. Sam:Look, I know he’s still a great scorer, and he’s better than the shooters, or guys who are supposed to be, than the Bulls have. But there are also unintended consequences, like all you’d have to give up to get someone else’s best player and how he’d fit with what you have. Plus, Anthony makes $28 million two years from now. Remember, also a serious knee surgery a few years back. Maybe payback for the Knicks signing an injured Joakim Noah for long term? So basically this would be your roster for the next three years with no chance to add someone else. And you’d probably have to give up your best draft picks to get him. Plus, let’s not forget when Anthony had the chance to join a Bulls team that really did have a chance to win a title he said no to return to New York. Sam:Why exactly would he now be waiving his no trade to move his family, which he says he doesn’t want to do, to live in a city he already rejected as inferior to New York, and his buddy Wade with an opt out after this season? And by the way with his trade kicker of 15 percent you’d be giving him maybe another $4 million or so on top of his contract just to come here and do all he’s done for the Knicks. Now what would that exactly be? I know I’ve got dozens of reasons why it makes no sense, but you probably did read it on the internet. A couple years ago, I recall you saying that opportunity and landing with the right team aren't major factors in an NBA player's success or failure, that it's talent and determination. I keep wondering about that. Certainly, for great talents that's probably true, but what about young guys coming in the league who are talented but not exceptional? Or anyone getting drafted by Sacramento or some of the other franchises in organizational dysphoria? At the moment, I'm thinking of Jerian Grant in this context. The more he plays, the better his stat line gets and the more effective he is in games. He couldn't get playing time in New York, and not much here, either, until the last month or so. It looks like he'll have an NBA career if he gets enough minutes to develop his game, but what if he'd been buried on some other team's bench? It seems like there must be several players drafted each year who enter into situations in which they can't succeed...though perhaps the Development League will help get them a second chance. Sam: Did I say are or aren’t? I’m sure I said are. I do have a typos problem at times. I probably said great talent will assure success or something from a Spiderman movie, but, sure, if you are not a great talent, and basically not selected in the lottery, opportunity matters a heck of a lot. The Chicago kid I’ve seen with the Windy City Bulls, Alfonzo McKinnie, is better than a lot of NBA players. But he wasn’t drafted, so teams have all these first round picks they’re paying, and while he’s good he’s really maybe not that much better or a difference maker. So you hang onto your end of rotation or bench guys since they’re not playing much anyway. Sam:One thing I’ve always believed is it helps a lot to have an NBA position. Jerian doesn’t quite. He’s really not a true point guard given he’s not a facilitator and he’s not quite the shooting guard, but it seems closer to that. Though they have Dwyane Wade there, and Jerian’s not exactly Klay Thompson. Jerian has gotten some regular playing time and seems like he’s earned more. He’s played well. He is one of the better scorers in limited playing time, aggressive with his shot, but more off the dribble, which compounds things since Butler and Wade are best that way, and too many guys pounding the ball stops things. So he doesn’t fit the greatest with those guys, but fits less off the bench since he’s not the facilitator Rondo is. Yes, talent is most important because if you have major talent they’ll find a place for you. The right team helps; being really good is much better. The Bulls need to trade Doug McDermott to somewhere where he can actually get some playing time. He's the last guy off the bench at this point and still the team's best shooter, by far. Terrible luck for Doug losing playing time to guys that can't shoot 40% from the floor. Sam: McDermott’s been a topic of media conversation lately, his playing time down the four games this month to about 15 minutes and seven points combined the last two. He’s in a shooting slump, though still with the best shooting percentage for threes on the team. I’ve written about his home shooting being poorer, I’ve believed, because he presses a bit much to please the home fans. But he hasn’t had a great road trip. Coach Fed Hoiberg said he had yet another great shooting practice, but Hoiberg did add the test is to bring it to the court. Obviously, McDermott doesn’t always, and, yes, he isn’t always the benefit of a team with guards looking for him. It’s the problem with the point guards the team has; just not many natural facilitators. I’m holding onto him. And while it keeps being mentioned the Bulls gave up two lower first round picks to move up for him, neither has done well and you just can’t get enough of McDermott’s skill. It took Kyle Korver a while and a few teams to find a spot. Remember, Bulls fans weren’t too upset to lose him, said he didn’t come up big in playoffs. You don’t give up to easily on a player who can shoot like that in this NBA. Even if they aren’t going in now. What's your take on Niko? He was an excellent rookie, and he had a very good second half last season after a first half marked by (what I thought was) an ill-advised placement as a SF and then the appendectomy. But this season he's often looked invisible or bad. He seems like a very nice guy (which is often the kiss of death, as in Snell). Do you have any behind-the-scenes take on him? Sam: I’m sort of working my way through what’s wrong with the roster. I think the rotation roulette has troubled some guys, though it’s hard to blame a coach for trying something different when what you are looking at isn’t working. 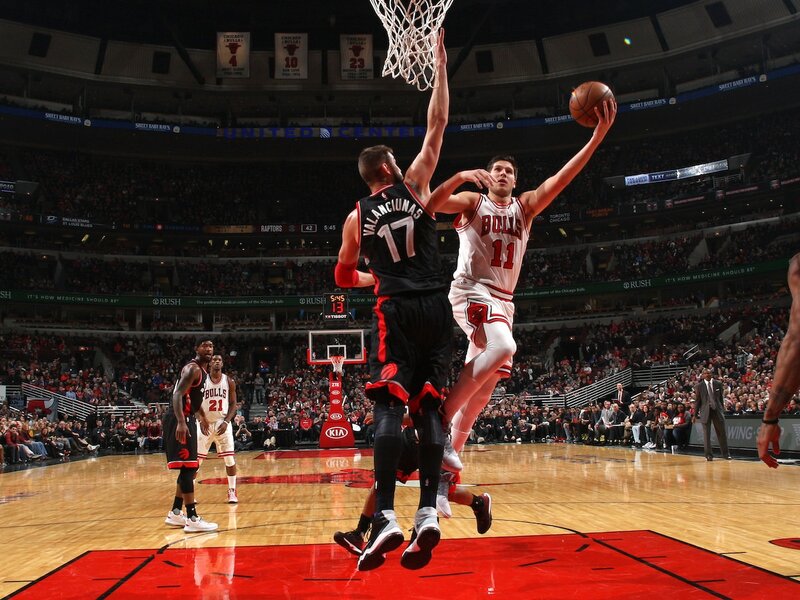 I generally get the sense with Mirotic, who is a thoughtful and intelligent guy, that he also thinks a bit much, like about being a free agent, like about trade rumors, like about everyone saying he shoots too far away or isn’t close enough, should put the ball on the floor, don’t put the ball on the floor, pump fake, no don’t pump fake. He wanted to win that starting job, and then didn’t, and then there were changes with the guards he played with and didn’t, and while a coach tries to settle on the heart of the roster, there are so many moving pieces. I still think there’s something there as here’s a 6-10 guy who can shoot, put the ball on the floor, defensive rebound. Sometimes you find yourself thinking about it all too much. What is the deal with Anthony Bennett? He's kind of a cross between Elton Brand and Draymond Green. He sends so talented but it seems like no one wants him. Is he the kind of guy that needs the ball to make an impact? Is that the problem? Sam: He probably was overdrafted, though it was a poor draft and everyone had him top 10. He is a bit smallish without the defensive component those guys had, especially Green, and let himself get out of shape and going into a bad team that had no idea LeBron would be coming back. And then when you wear that bust label it can bring you down. Though when I consider Bennett, and he obviously didn’t work out, it is one of the ways I think you can build in this era without blowing up your team and starting again in the lottery. There are a lot of first round picks for whatever reason who don’t make it right away or just need time, but teams don’t have much time to be patient with these kids. So they start moving around. Like Chauncey Billups, whom the Pistons hit on as his fifth team. Usually, there are good reasons teams give up on guys, but sometimes teams just come to hate a guy for not being who they want him to be. Kyle Lowry bounced around plenty; Tyson Chandler. There are guys who were so called first round busts who might work with you. It’s not easy and a risk, as the teams who tried Bennett found out as I think he’s now in Turkey. But there are guys out there. I think the main issue for the last 2 seasons is that the Bulls do not have a clear vision, a clear direction of the team's targets and the way to reach them. A couple of years ago they maxed out Jimmy making a statement that the plan is to move from the Rose era to the Jimmy era which in my opinion was the correct decision. Then they fired Thibodeau as they believed that he was running out the players and was too much focused on defense. In my opinion the first part was completely justified as you can see the careers on Lu, Noah and Rose and others after all those minutes under Thibs. They handpicked Fred Hoiberg as they liked the style of play he had in his college and his "laid back" attitude. They waited for years to bring Mirotic from Real Madrid and traded 2 first round picks for McDermott. All those decisions were correct in theory... but what did they do after to support those decisions? They brought Wade and Rondo to swallow minutes. In the shooters' era the team has limited shooters. Do you really think that the management has a clear view of where they want the team to go? Sam: You actually kind of agree with their plan, moving on from the former group because of age, injury and overwork. That’s what they did; but they just did it. Remember, it was less than a year ago they did so with last summer’s departures of Rose, Noah and Gasol. They didn’t have a formal plan then, and really couldn’t have because no one knew the ramifications of the new collective bargaining agreement, which was signed in December. Now we are finding out it’s going to make it more difficult to sign top free agents. So all teams have to do some reassessment. But the Bulls were a serious contender and free agent player for six years. That just ended last summer. I saw a chart in The Tribune this week that said the Bulls were basically tied with Boston for the best record in the Eastern Conference since the 2003-04 season, which was when LeBron arrived. Sam:So it’s not quite like they were the Knicks, Nets, 76ers or Wizards. They were contending in some form, but like Eastern teams in the 90s against Michael or Western teams in the 80s against Magic, there wasn’t ultimate success to be gained, unfortunately. So now you try to figure out a new path, but you can’t do it in five months. Sometimes teams bottom out; not just the 76ers. Look at the 80s Nuggets, who were a dynamo against the Lakers year after year, but couldn’t break through and then won 11 games one season. It takes awhile to even begin in a new direction and to even figure out what it is. The Knicks are working on two decades of that. That’s why Rondo and Wade was understandable: Short term deals while you are still playing for something—when guys play for nothing they become losers as we saw with the early 2000 Bulls—and see what you have, which they have been doing. Sam:It doesn’t suggest a firm rotation, but it’s difficult to balance the rotation of a competitor with the needs of a team in transition. It’s easy to say have a plan, but most plans I’ve seen are based on getting lucky. LeBron returns, then you can trade your future for Kevin Love, Kyle Korver and Channing Frye. Jimmy’s a start, but darned if anyone can tell yet with the Bulls in less than a full season since they broke up their team what the next finished product will or should look like. And remember the huge money last summer was spent to get the likes of Harrison Barnes, Evan Turner and Chandler Parsons. Those were your $100 million free agent players. Was it a mistake not to invest your future in them? It's true that only a few Bulls have distinguished themselves, and that we have a lot of raw young guys. But I still think you have to decide on a rotation, or none of those guys can become consistent. The way it's going, when they get on the court, they're not used to their teammates, they don't know their exact roles, and now they're probably playing 'scared' that if they have a bad stretch, they might not see the court again for 4 or 5 games. Nobody develops their game or plays their best without some consistency. I understand Fred's dilemma. MCW handles the ball well, but can't shoot or defend 'waterbugs. Grant can shoot and defend better, but has no point-guard skills. Denzel is smart, passes and can shoot, but is a little slow on D. But you have to make some decisions on who to go with, and use the others as best you can. I guess we'll have to wait and see what the Bulls do this summer (or can do this summer) to give Fred a better roster. At this point, I don't know if we'll have Wade or Rondo back. Wade seems frustrated and Rondo can't be happy at having been benched for 5 games after leading the NBA in assists last year. I just hope we can keep Taj in town. I think he'll get some juicy offers. Or maybe they'll trade Butler and start all over again... So which guys do you think are 'keepers'? Sam: I’m guessing Jimmy remains a keeper, though when you are a .500 team no one is absolutely untouchable. Though it seems short term thinking, I think most of the NBA thinks that way: We’ll see what happens in the playoffs, or if they make it. It’s amazing how much things can change with a good playoff run. Or none. I agree in theory you want to have a regular rotation and that buttresses the player’s confidence and, ergo, his production. In theory, anyway. But when they don’t produce all I hear is how could the coach not make a change. Not that those who write me are the most knowledgeable, but they do watch. Sam:Fred’s made clear if you play well regularly you are playing; unless you are Jimmy and Dwyane, who are playing, anyway. But you better have them, at least for now. I personally think Wade opts in and I think they hang onto Rondo as his salary may be good to use for trade purposes after the season. He was always slated basically for one year, but he really is, despite what we thought coming in, a real leader for the young players, maybe the team’s best, and certainly loudest voice in practice. You have to earn your keep, as it’s said, and I think the post All-Star push and playoffs, if there are, will show us who they’ll keep.